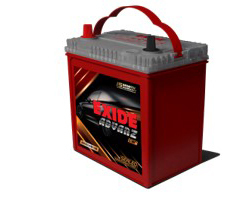 True Maintenance Free Battery with Advanced Ca-Ca Alloy System - Topping up is not required during the entire service life. Duplex Cover design having unique tortuous path & flow-back mechanism, improves Spill-proof Characteristics under arduous vehicle vibration & battery tilts during handling. Technology: Ca-Ca Alloy System to suit high temperature and very low water loss feature. Instant start every time: Better cranking power and life expectancy ensure customer satisfaction. Ready to Use: Batteries are factory charged and ready to use condition.